This post is about optimizing the AABB tree that we're using as our main acceleration structure. I will use the polly scene from previous post for the tests, but have increased the output resolution to get results a bit more meaningful. We're spending 24% of run time recreating the implicit representation of the rays again and again for each tree node. Instead of that, we can compute it once at the top of the tree, and pass it down to the nodes (this commit). 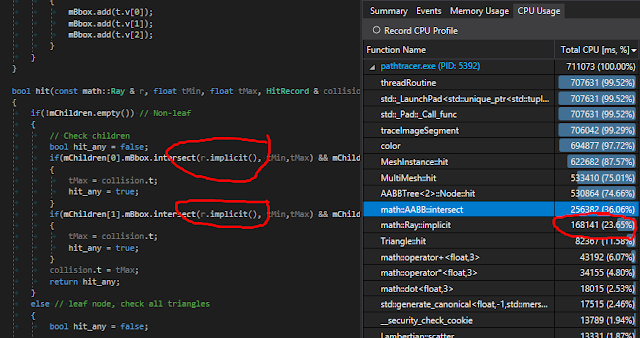 This is the usual algorithm of finding the intersection interval (I think it's called the 'slab' method). 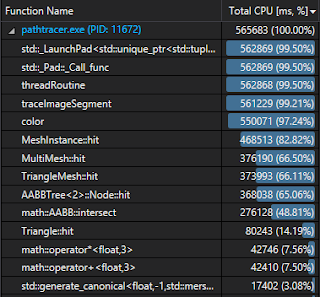 That's another 32% faster than the non SIMD version. While that code seems to do a good job in general, it doesn't handle the edge cases properly (neither version does). Let's examine first the scalar version of the code, fix it, and then see how to turn that into proper vector code. I also wrote some tests to verify the correct handling of edge cases. Unsurprisingly, the code above didn't pass them. For any finite bounding box, mMin and mMax can not contain infinities, so no matter where the origin of the ray is, this subtraction will not result in NaN. It can be +- infinity, but a normalized direction's inverse can never contain 0. The inverse case is still possible, though. When the ray's origin coincides with one of the boundaries of the box, and the ray's direction is parallel to that plane, we have 0*infinity = NaN. If the box has 0 size in the direction perpendicular to the plane, this NaN will propagate to both t1 and t2. Otherwise it will only happen in one of them at most for each coordinate. What we need now, is a way to contain that NaN, when it happens, so it never reaches the end result. First, let's group all those max, min operations into a 'vector' operation to make them clearer. I'm using vector here in the sense that we're using the vector classes in the math library to improve readability, not in the SIMD vector sense. This code is almost good. A NaN from t1 or t2 can make it into tEnter and tExit. Since comparing NaN with any number will return false, both std::min and std::max will return the first argument, meaning that when NaN is that first argument, we'll be destroying information from the other argument (which can be valid information). Moreover, if math::max and math::min of our vector class are internally based on std::max and min, NaNs in t1 will make it into both tEnter and tLeave, destroying more information. However, if we're clever in reordering our calls, we can use this property to our advantage. Since _tmin and _tmax can not be NaN in a well formed call to this function, the code above will preserve valid information and destroy the NaNs. Also, since we swaped the order of t1 and t2 in the second line, NaNs from those will only make it into one of the boundary vectors (except in the case of a degenerate AABB with no volume, where there's no information to preserve anyway). With this new version, rays contained withing one of the sides of the AABB will behave as if intersecting the volume at the same time than some other coordinate, and since a unit vector can't be parallel to 3 perpendicular planes, there will always be at least one dimension in which this gives a valid number. Also, +-infinities get gracefully resolved by the max and mins as +infinities will be part of exits and -infinities will be part of entries, making them irrelevant extremes (e.g. any finite exit will be smaller than infinity). Now, how does this code perform? Our Polly test scene, in the same conditions as before, takes about 102 seconds on average, making 1.3 million primary rays per second. Runs about 8% faster, and produces more correct results. Why faster? I'm guessing that not leaving the SIMD code until the very end helps here, but I haven't inspected the generated assembly. 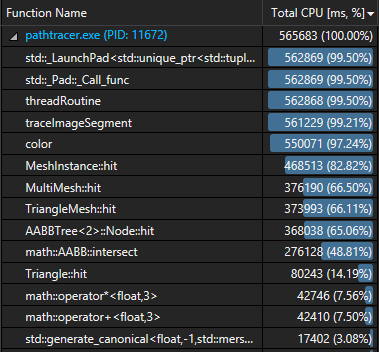 Overall, by using SIMD code, AABB intersection tests have gone from ~78 seconds (48% of 162 seconds) to ~31 seconds, which is 60% faster. Since we're only using 3 of the four components of the SIMD vectors, our theoretical limit was 66% improvement, and this is quite close. We can still try to do better by performing many tests at once, instead of vectorizing the internals of the test. We can also play aroung with memory layouts, or improve the distribution of our tree, so we hopefully do less tests in the first place. 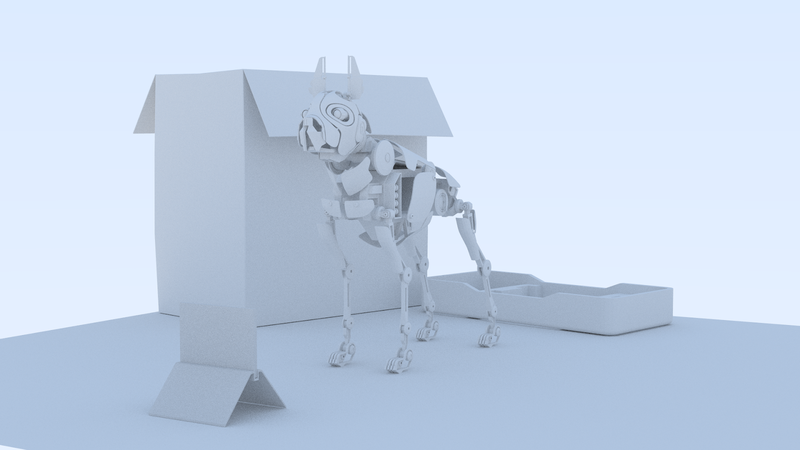 Another possibility is going back to adding features to the raytracer. Textures would be a nice one.